The OENumericMolFunc2 class converts a OEMolFunc1 into a OEMolFunc2 by providing numeric hessians. The molecule function used for function evaluation and to be converted must be provided as the first argument to the constructor. The second argument specifies the scaling factor. The third argument specifies whether the OENumericMolFunc2 object takes ownership of the memory of the molecule function instance. By default that does not happen, so the OENumericMolFunc2 destructor does not delete the molecule function instance. 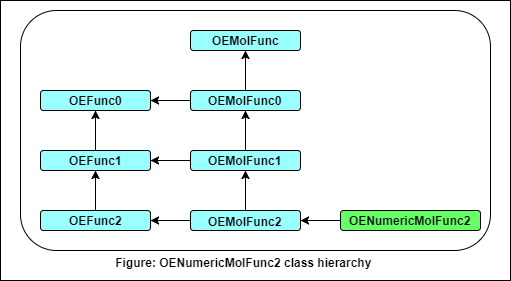 If ownership of the molecule function is transferred to the OENumericMolFunc2 instance, the molecule function’s delete operator will be called in the OENumericMolFunc2 destructor. Predicates are passed directly to the molecule function that is to be scaled.